Black Stars of Ghana defender John Paintsil is in police custody in his native country after being accused of assaulting his wife. The former West Ham and Fulham defender, who last played in England with Leicester City, is currently being held in the Legon station in the capital Accra. 'The wife scaled a wall to a neighbour’s house for protection and immediately, John Paintsil also pursued her, came to the neighbour’s house, gave him some slaps and threatened to shoot him. 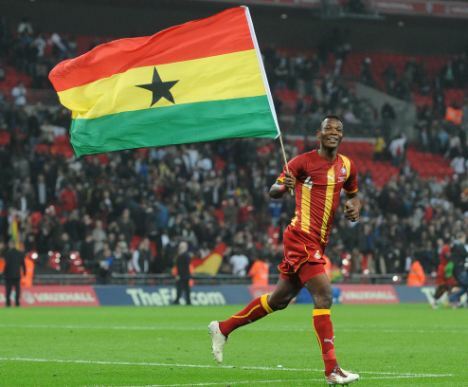 The police spokesman, Tettey was unable to confirm details on the status of Paintsil's wife, Richlove's health. 'She collapsed, which suggests she is in a critical condition, but for now we don’t know her current state,' he told BBC Sport. It is understood that the police can only keep Paintsil in custody for 48 hours before deciding whether or not to charge him. Paintsil, who is thirty one years old was recently a member of the Black Stars of Ghana team that finished fourth at the Africa Cup of Nations in South Africa.